UN Women launches flagship programme initiative to collect data about women’s lives. Building on commitments made in May this year on 21 September, during the 71st session of the United Nations General Assembly, UN Women launched a new public-private partnership called “Making Every Woman and Girl Count”. 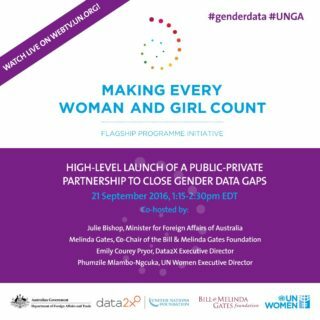 This 5-year, USD65 million initiative has been set up to close the gender data gaps for Sustainable Development Goal (SDG) monitoring and accountability and build an integrated evidence base that can inform more effective and targeted decision-making. 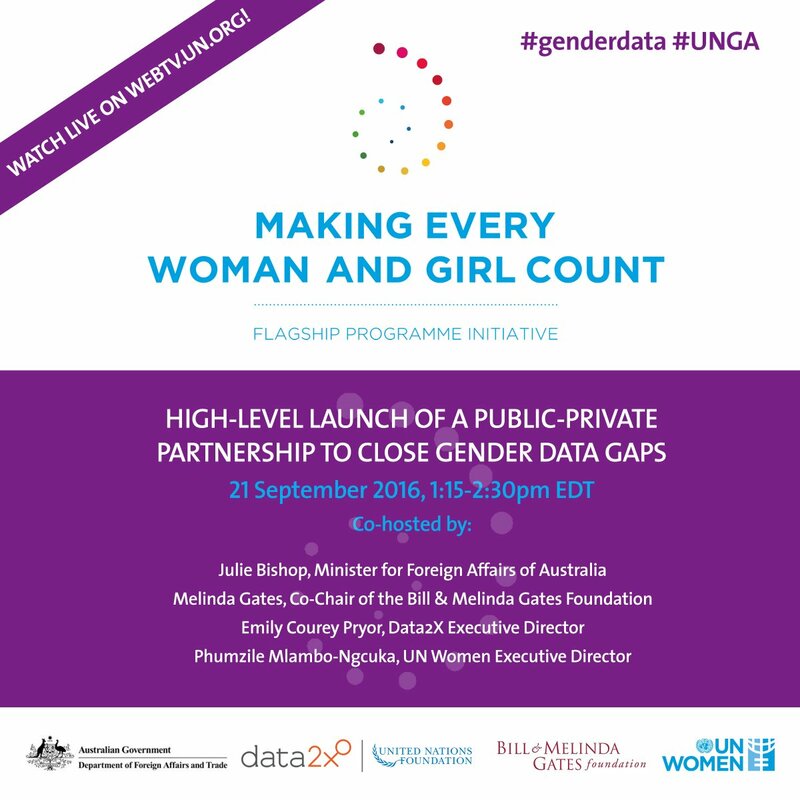 It is being co-organised with the government of Australia, the Bill & Melinda Gates Foundation and the Data2X initiative of the UN Foundation. It brings together developed and developing countries, multilateral agencies, private foundations and civil society organisations under a new, issue-based “flagship programme”, which provides a collaborative and fund-raising framework. The launch was the first of these programmes, and was directed at ensuring a radical shift in the production, availability, accessibility and use of quality data and statistics on key aspects of gender equality and women’s empowerment. Phumzile Mlambo-Ngcuka, UN Under-Secretary-General and Executive Director of UN Women pointed out that on any given day, it is estimated that globally we produce 2.5 quadrillion bytes of data, yet when it comes to measuring gender equality and the empowerment of women and girls, in both developing and developed countries, we are “data-poor”. There are, Mlambo-Ngcuka said, gaping holes in data for some of the most rudimentary information about women’s and girls’ lives. These range from a complete lack of hard facts on how many women and girls live in poverty to biased measures of women’s engagement in economic activities that are based on sexist assumptions about women’s roles in the household. Whether as governments or as individuals, she continued: to make sound decisions we need precise and reliable information. As citizens, we need data on service delivery and government spending to be able to hold our leaders accountable for progress. Currently, the data gap is so wide that there is adequate information for less than one quarter of the key performance indicators selected to monitor the gender-specific elements of the new Sustainable Development Goals. When it comes to gender data, the traditional North-South, Developed-Developing and public-private divides no longer hold: very few developed or developing countries can truly claim to have good enough information systems. This has a direct impact on our ability to quantify an issue and make the right decisions on solutions. For example, we need time-use data in order to understand the extent of women’s paid and unpaid work and the challenges they face in balancing the two. Unpaid care work is a key barrier to women earning a decent living and moving out of a repeating cycle of poverty. Yet only about half of developed countries have any time-use data since 2000, despite their relatively well-resourced statistical systems. The cost and complexity of collecting data on these issues is often given as a reason for failure. Yet, in a world where sufficient data and resources are available to achieve self-driving cars, it seems hard to see why we can’t afford navigational aids for society. Ample evidence exists for the gains to be made from improving gender equality, Mlambo-Ngcuka said: a McKinsey Global Institute report last year indicated that USD12 trillion could be added to global growth by advancing women’s equality.